And then I had fun with some sight words printables! I mean, how cool do the sight words word find pages look??! 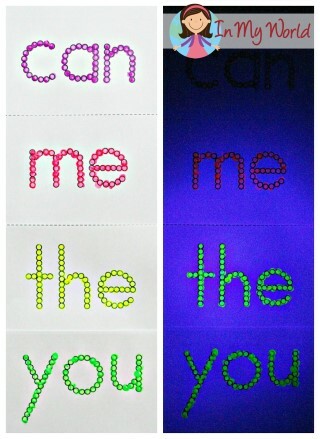 Even though the blue and pink didn’t do well under the black light, the other colours looked marvelous! I also bought some “fluro” paint to use on my sight word q-tip printables… clearly the purple and pink didn’t “fluoro” very well, but at least the yellow and green did their job! 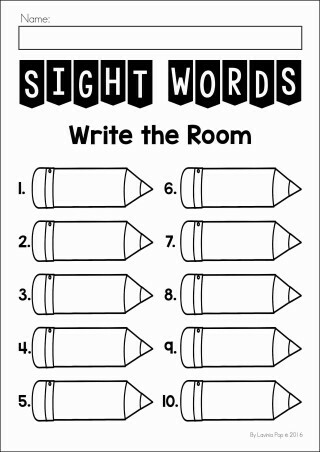 Once dry, you can attach the q-tip sight word cards to the walls (ceiling, maybe?!?) 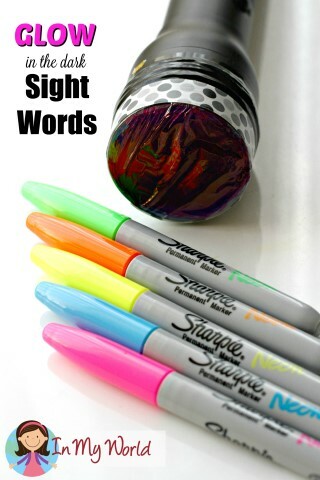 and give your kiddos some small black light flashlights and a copy of the FREE printable below, and you’ve got yourself a super-duper fun write the room activity! Thanks so much for stopping by! 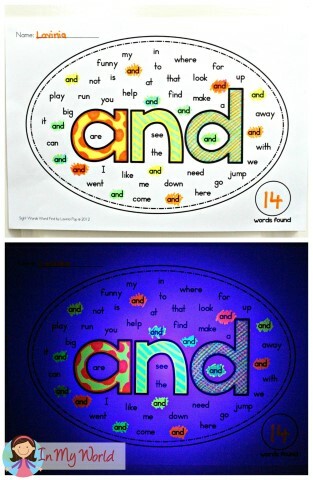 I hope you liked this glow in the dark sight word idea and that it is something you can use in your classroom or home! I love this! You are very creative and always inspire me! Thanks for sharing! This is fun! My husband loves blue lighting–he owns five saltwater tanks with corals that glow in blue lights. He might love this even more than my kids! 🙂 Thanks. I’ll be using this for our homeschool year.